By Robert H. Sheinberg, D.P.M., D.A.B.P.S., F.A.C.F.A.S. Stress fractures of the navicular are relatively common injuries that occur in athletes. They are more common in sports that require a lot of sprinting or running on the ball of the foot. They are very subtle injuries that are often misdiagnosed as an ankle sprain. Patients usually present with pain across the top part of the foot just in front of the ankle. It is often vague in nature and pain is present more commonly in the mid or later part of an activity. Over time an athlete would have a difficult time running on the foot. These fractures need to be identified and treated as early as possible. X-rays may be negative in the initial presentation. It may require an MRI to evaluate the navicular. If there is bone marrow edema of the bone without any fracture line, then this can be treated conservatively with a short course of nonweightbearing in a boot or cast. If there is a suggestion that there is a fracture to the navicular, CT scans are important to get the full extent of the injury. If evaluated and treated early, stress fractures can heal with a conservative approach. A minimum of eight weeks nonweightbearing in a cast is important. These fractures may take 3-4 months before they heal. In some cases, the fracture does not heal and the problem becomes more chronic. Patients are then given the choice of doing a surgical procedure to correct the problem. If the margins of the bone are hard and sclerotic limiting the blood supply to the area then these margins need to be removed and bone grafted. 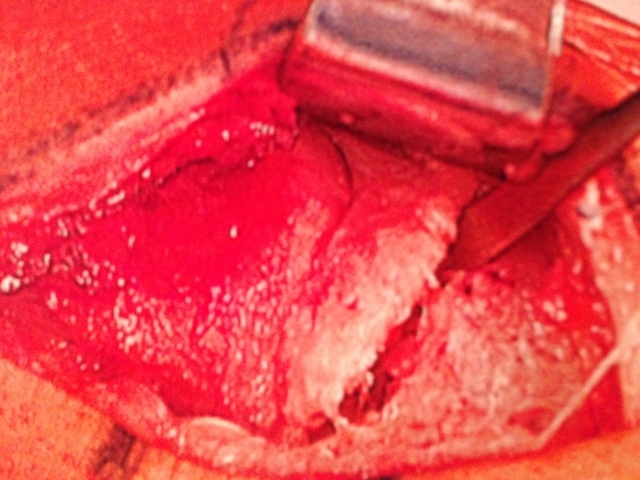 A small plate or screws are then applied to the area to allow the area to heal primarily. This would require the athlete to be off from running sports for 4-12 months. Follow up examinations with a CT scan may be necessary to fully evaluate the healing process. Stress fractures of the navicular bone are a result of an impact to the bone resulting in compression between the cuneiforms and the talus acting like a nutcracker of sorts. Depicted below is the type of stress to the bone to cause stress injury or fracture depending on the amount of force that was inflicted with an injury. 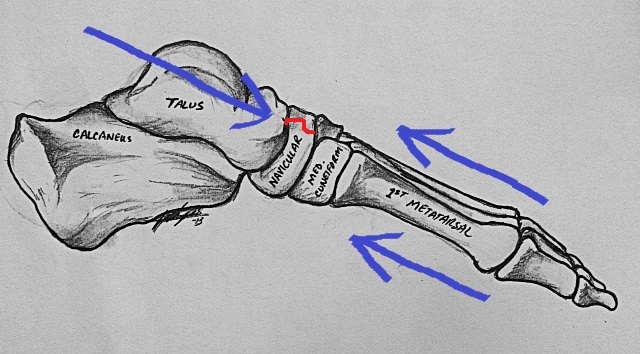 The force is indicated by the blue arrows and the injury by the red line which is most commonly seen in the medial 1/3rd of the bone. The images below demonstrate in CT scan (left) a fracture of the navicular bone and post-surgical repair of the fracture on a lateral x-ray (right) with surgical screws and pin.